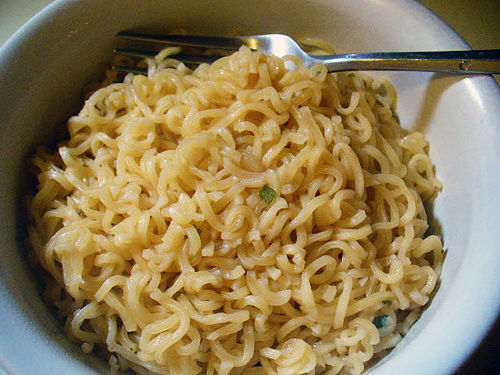 [/media-credit] Ramen noodles, a campus staple for students with culinary challenges. When Hollis Ledbetter dropped her son, Jakob, off at the University of Georgia in Athens, Ga., three years ago she noticed something alarming about the then freshman’s dorm room. This was similar to a distressed call home she received from her third daughter, Marlyn, at Georgia Southern University asking her mother for help to cook something for dinner. For Ledbetter, a mother of four and grandmother to six, enough was enough. “Okay, I really gotta do something about this,” she thought. So she got to work, pulling recipes from her mother, mother-in-law, husband and her own to create “Oh My Gosh! I’m in College and I Never Learned to Cook!” Aside from a love of cooking that she and her husband share, Ledbetter’s motivation for the cookbook stemmed from a growing concern for her children’s generation and what she saw as a lack of knowledge in the kitchen once they left home. Nisha Vashisht, a sophomore chemistry major at the University of Denver, is not uneducated when it comes to the topic of feeding herself. She can boil water and cook pasta. She can clean and broil meat. For her, it is not that she doesn’t know how to cook; it’s that she usually doesn’t want to. Like many college students, she found a solution in her dining hall, which is on the bottom floor of her residence building, along with a Starbucks. Food options like these were not always available to college students, Ledbetter says, and it’s part of the source of students’ resistance to cooking. “Fast food is on every corner of where you go. Students have a tendency to to think ‘Oh I can just go pick it up here,'” said Ledbetter, who had to make salads, sandwiches and other items when she was in college. Despite the convenience, eating out frequently can have negative health and economic effects. Students can save anywhere from $1,000 to $2,400 by cooking instead of eating out, Ledbetter said in a press release from her book. Then there are those like Jessica Harder, a junior majoring in animal sciences at New Mexico State University, who defy their convenient surroundings and enjoy the domesticity of seeing a meal from start to finish. “I absolutely love to cook,” Harder says. As a little girl in New Mexico, she grew up in the kitchen with her mother and grandmother who are wonderful cooks, she says. It was that time in the kitchen absorbing the scene that influenced her favorite dishes like New Mexican chili, enchiladas, crepes and lasagna. The convenient options, like cafeteria food, were close to unbearable for Harder. She struggles to remember the times she has even used her microwave, other than to melt butter for a recipe. This week she plans to make green chile chicken alfredo in her kitchen apartment. Though Harder does not fall under the characteristics Ledbetter has assigned to her age group, she does support another theory of the author’s. It is Ledbetter’s belief that a child’s cooking habits are typically adopted from their parents. Harder credits her love of cooking to the generations of women who were always in her kitchen. Wishing to be part of that world, she always stuck around and learned what they were doing. Ledbetter suggests that parents take on a more inclusive role, like Harder’s mother and grandmother did, to make kids feel more involved in the kitchen. Unintentional shielding from the kitchen transforms food preparation into an unknown, intimidating world. This is sometimes easier said than done, she says. It’s hard for many parents to make the transition from the sole provider to an onlooker, there for occasional advice. “We have seen our kids nutritionally for two decades, and then all of the sudden they go off to college,” she says. “We’re so prepared for picking up their stuff, getting them ready for college that we don’t think about when they get their first apartment.” The result is often a state of bewilderment for their sons and daughters when they, too, realize that it’s their responsibility to deal with the kitchen and feed themselves. Sarita Reddy, mother of Nisha Vashisht, brought her daughter home-cooked meals on a regular basis during her freshman year. She can relate to her daughter’s aversion to everyday cooking. It’s something she herself could live without. Nisha was never in the kitchen with her mother when she was younger, mostly because her mother doesn’t enjoy people in the kitchen helping her. She would rather cook for friends and family, as they sit around and entertain her. Beyond the basics of feeding oneself, Reddy believes that cooking is a choice, and she respects her daughter’s choice whether she does or does not learn how to be an amazing cook. Plus, Reddy says, college makes it easy to make the latter decision. Reddy did not leave her home in India until she was 23. Like many of her peers, she stayed home and went to school. Her family had people around the house who assisted with things like helping her mother in the kitchen. This left Reddy completely unaware of basic cooking or cleaning skills she would need to live alone in the United States while she earned a Ph.D. in psychology at the University of Georgia. She couldn’t even clean her apartment floor, but she eventually learned everything she needed to know. Perhaps this is why she is not worried about children when they leave college and are no longer protected by the amenities of their school or the kindness of their parents. People adapt to learn what they need to, she says, and children of this generation will do the same. The owner’s atcions really show that she wants your business I would go back, but be more cautious in what you order. Deep fried bugs are better than simmering ones.